Guitarist John McLaughlin performing onstage with his band the 4th Dimension at the Wilbur Theatre Wednesday night . 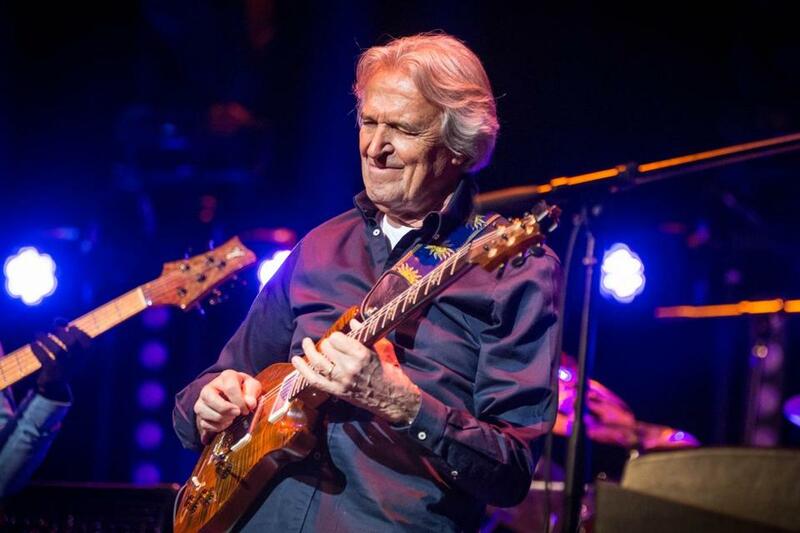 British guitar virtuoso John McLaughlin has played Boston many times over his lengthy career: with the improvisation-driven Tony Williams Lifetime, with the fiery Mahavishnu Orchestra, with the Indian-influenced Shakti. His visit to the Wilbur Theatre on Wednesday, with his crack band the 4th Dimension, was part of what’s being billed as his American Farewell Tour. But McLaughlin, 75, didn’t appear ready for retirement. After a searing, hourlong instrumental set from another ace guitarist, Jimmy Herring, with his recently formed band the Invisible Whip, McLaughlin and band (Gary Husband on keyboards and drums, Étienne Mbappé on bass, Ranjit Barot on drums) hit the stage with what looked, sounded, and felt like a supply of boundless energy.